We are the only E-series dealer in the world and as well as owning over 30 sets are passionate about there superb looks, sound and of course survival! If your looking to sell, buy or refurbish some of these classics speakers or require parts please call or mail us, we have been dealing with this range of speakers for over 28 years! 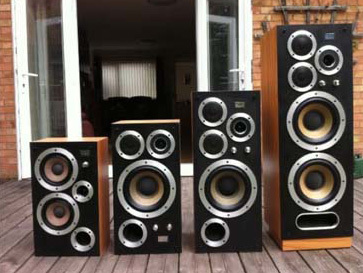 We have taken in tatty pairs of speakers and sent them back looking like new! We will pay top price for your speakers and usually collect too! Mending bass, mid and tweeters (keeping original) – if your speaker cone is scratchy or the glue has broken down so the edge rubber is coming away, we can repair this with a 5 year warranty! We are based in Birmingham (UK) and will travel to collect if distance is a problem!